I’ve worked hard to create a caring, open, engaging, intense, active environment to learn that extends well beyond the classroom! I am also developing project management skills in undergraduate physics students and I'm also developing podcast instruction and review material for undergraduate physics students. My teaching focus starts and ends with my love and care of my students. As their professor, I believe it’s my job to help them hone both academic and professional skillsets, and to provide support and encouragement along the way. I challenge them with difficult problem-solving activities, an interactive classroom environment, and career-focused education. In the research lab, my focus is on giving students hands-on experience in a theoretical and laboratory environment so that students are well prepared for careers in physics and engineering after Adelphi. In order to accomplish this goal, I provide technical training, small individualized projects that fit the students interests, and numerous fun engaging team building events. Finally, my “student first” philosophy is also represented in my service. Students are always welcome to stop in and speak to me about homework, career decisions, and course recommendations (although the continuous line at my door makes it difficult to get grading done!). Adelphi’s 3-2 engineering program requirements with Columbia are particularly tricky, so I’ve identified several best paths for success, and share these while counseling students – many students who are not my advisees stop in for advice. I enjoy being an integral part of the physics department, especially where recruitment and retention of students is concerned. Two years ago, I was thrilled to feel students’ mutual admiration when I was voted Adelphi Student Government’s professor of the year. I was also nominated for the untenured teaching excellence award in both 2014-2015 and 2015-2016 school years. Again last year, I was overwhelmed to be selected as the untenured teaching excellence award winner. Laser cooling and trapping of atoms and molecules. Develop a laboratory for generating arbitrarily-shaped frequency chirped laser pulses on a time scale faster than 1 ns. ­Control and study atomic excitation on nanosecond and sub-nanosecond time scales. Coherent control of ultracold collisions with frequency-chirped laser pulses. M.J. Wright. Put Teaching First. Faculty Focus. October 1, 2018. M.J. Wright. How to Fail: The Lesson We’re Forgetting to Teach Our Students. Diverse: Issues In Higher Education. April 26, 2018. B. Kaufman, T. Paltoo, T. Grogan, T. Pena, J. P. St. John, and M. J. Wright (2017). Pulsed, Controlled, Frequency-Chirped Laser Light at GHz Detunings for Atomic Physics Experiments. Appl. Phys. B 123, 58. K. Teng, M. Disla, J. Dellatto, A. Limani, B. Kaufman, M. J. Wright (2015), Frequency Chirped Light at Large Detuning with an Injection-Locked Diode Laser. Review of Scientific Instruments, 86, 043114. M. J. Wright (2015), Semi-Classical Calculations of Ultracold Collisions with Frequency Chirped Light: Dependence on Chirp Rate. Euro. Phys. J. D. , 69, 6. P. Pieri, A. Perali, G.C. Strinati, S. Riedl, M.J. Wright, A. Altmeyer, C. Kohstall, E.R. Sánchez Guajardo, J. Hecker Denschlag, and R. Grimm. (2011), Pairing-gap, pseudo-gap, and no-gap phases in rf spectra of a trapped unitary 6Li gas. Phys. Rev. A, 84, 011608. H.-I Lu, J. Rasmussen, M.J. Wright, D. Patterson, J.M. Doyle. (2011), Cold and Slow Molecular Beam. Phys. Chem. Chem. Phys., 13, 18986. S. Riedl, E.R. Sanchez Guajardo, C. Kohstall, A. Altmeyer, M.J. Wright, J. Hecker Denschlag, R. Grimm, G. M. Bruun, and H. Smith. (2008), Collective Oscillations of a Fermi Gas in the Unitarity Limit: Temperature Effects and the Role of Pair Correlations. Phys. Rev. A, 78, 05369. M.J. Wright, A. Pechkis, J.L. Carini, S. Kullish, R. Kosloff, P.L. Gould. (2007), Coherent Control of Ultracold Collisions with Chirped Light: Direction Matters. Phys. Rev. A, 75, 051401(R). C.E. Rogers III, M.J. Wright, J.L. Carini, J.A. Pechkis, P.L. Gould. (2007), Generation of Arbitrary Frequency Chirps with a Fiber-Based Phase Modulator and Self-Injection-Locked Diode Laser. JOSA B, 24, 1249. A. Altmeyer, S. Riedl, C. Kohstall, M.J. Wright, R. Geursen, M. Bartenstein, C. Chin, J. Hecker Denschlag, and R. Grimm. (2007), Precision Measurements of Collective Oscillations in the BEC-BCS Crossover. Phys. Rev. Lett., 98, 040401. A. Altmeyer, S. Riedl, C. Kohstall, M.J. Wright, J. Hecker Denschlag, R. Grimm. (2007), Collective Oscillations of the Radial Quadrupole Mode in the BEC-BCS Crossover. Phys. Rev. A, 76, 033610. M.J. Wright, S. Riedl, A. Altmeyer, C. Kohstall, E. Sanchez, J. Hecker Denschlag, R. Grimm (2007), Finite Temperature Studies of the Scissors Mode in the BEC-BCS Crossover. Phys. Rev. Lett., 99, 150403. M.J. Wright, J.A. Pechkis, J.L. Carini, and P.L. Gould. (2006), Probing Ultracold Collisional Dynamics with Frequency-chirped Pulses. Phys. Rev. A, 74, 063402. M.J. Wright, S.D. Gensemer, J. Vala, R. Kosloff, P.L. Gould. (2005), Control of Ultracold Collisions with Frequency-chirped Light. Phys. Rev. Lett., 95, 063001. M.J. Wright, P.L. Gould, S.D. Gensemer (2004), Frequency-chirped Light from an Injection-locked Diode Laser. Rev. Sci. Instrum., 75, 4718. K. Oldja and M.J. Wright. Controlling Atomic Excitation with Frequency-Modulated Lasers. APS March Meeting. Los Angeles, 2018. K. Tadesse and M.J. Wright. Control and Stabilization of Frequency and Intensity of an External Cavity Diode Laser. APS March Meeting. Los Angeles, 2018. T. Grogan and M.J. Wright. Towards Control of Ultracold Collisions Using Frequency-Chirped Laser Light. APS March Meeting. New Orleans, LA 2017. E. Ochoa-Madrid, L. Chau, and M. J. Wright. Creating an Interactive Video Vignette on the Topic of Torque. 2016 Quadrennial Physics Congress. San Francisco, CA 2016. T. Pena, J. P. St. John, and M. J. Wright. Development of a Simple Optimization Algorithm for Use in Atomic Physics Experiments. 2016 Quadrennial Physics Congress. San Francisco, CA 2016. T. Pena, J. P. St. John, and M. J. Wright. Development of a Simple Optimization Algorithm for Use in Atomic Physics Experiments. Frontiers in Optics: The 100th OSA Annual Meeting and Exhibit/Laser Science XXXII. Rochester, NY 2016. B. Kaufman, T. Paltoo, T. Grogan, and M. J. Wright. (2016). Pulse Controlled Frequency-Chirped Laser Light at Large Detuning for Use in Atomic, Molecular, and Optical Physics Experiments. In Annual Meeting of the American Physical’s Societies Division of Atomic, Molecular, and Optical Physics.. Providence, RI. B. Kaufman , T. Grogan , T. Paltoo, and M. J. Wright. (2016). Rapid Adiabatic Passage in a Rb gas with intense Frequency Chirped Laser Light. In APS March Meeting.. Baltimore, MD. T. Paltoo, T. Grogan , B. Kaufman, and M. J. Wright. (2016). Controlled, Pulsed Frequency Chirped Laser Light at Large Detuning. In APS March Meeting.. Baltimore, MD. M. J. Wright and B. Grifford. (2015). Learner Driven Podcasts in an Upper Level Physics Course. In AAPT Summer Meeting.. College Park, MD. B. Kaufman, A. Limani, K. Teng, M. Disla, J. Dellatto, and M. J. Wright. (2015). Pulsed and Frequency Chirped Laser Light at Large Detuning. In Annual Meeting of the American Physical’s Societies Division of Atomic, Molecular, and Optical Physics.. Columbus, OH. A. Limani, K. Teng, M. Disla, J. Dellatto, B. Kaufman, and M. J. Wright. (2015). Pulsing Frequency Chirped Light at Large Detuning with an Injection-Locked Diode Laser. In 29th Annual National Conference on Undergraduate Research.. Seattle, WA. M. J. Wright. (2014). Controlling Thermal Collisions with Frequency-Chirped Light. In Annual Meeting of the American Physical’s Societies Division of Atomic, Molecular, and Optical Physics.. Madison, WI. M. Disla and M. J. Wright. (2014). Progress Towards a Dense Atomic Beam. In APS March Meeting.. Denver, CO.
J. Dellatto, M. Disla, B. Kaufman, K. Teng, A. Limani, and M. J. Wright. (2014). Progress Toward Injection Locking a 795 nm Diode laser to a Microwave Modulated Sideband. In APS March Meeting.. Denver, CO.
M. J. Wright. (2014). Controlling Thermal Collisions with Frequency-Chirped Light. In APS March Meeting.. Denver, CO.
Drayna G K, Wright M, Chae E, Hemmerling B, and Doyle J M (2012). Progress towards MOTs of Yb and CaF, loaded from a slow buffer-gas beam. In The 23rd International Conference on Atomic Physics ICAP 2012. Palaiseau, France. M. Wright, H-I Lu, J. Rasmussen, D. Patterson, and J. Doyle. (2011). Towards Magnetic Trapping of CaH. Annual Meeting of the APS Division of Atomic, Molecular and Optical Physics. Atlanta, Ga.
M.J. Wright, H.-I Lu, J. Rasmussen, D. Patterson, J.M. Doyle. (2011). Progress Toward Magnetically Trapping CaH. Tegernsee, Germany. M.J. Wright, S. Riedl, A. Altmeyer, C. Kohstall, E. Sanchez, J. Hecker Denschlag, R. Grimm. (2007). Scissors Mode Oscillations for a Finite-Temperature Strongly-Interacting Ultracold Fermi Gas. In Annual Meeting of the American Physical’s Societies Division of Atomic, Molecular, and Optical Physics. Calgary, Canada. M.J. Wright, J. Pechkis, J. Carini, P.L. Gould. (2006). Control of Ultracold Collisions with Frequency-Chirped Light. In International Conference of Atomic Physics. Innsbruck, Austria. M.J. Wright, J. Pechkis, S.D. Gensemer, J. Vala, R. Kosloff, P.L. Gould. (2006). Ultracold Collisions with Frequency-Chirped Light: the Influence of Chirp Direction. In Annual Meeting of the American Physical’s Societies Division of Atomic, Molecular, and Optical Physics. Lincoln, NE. M.J. Wright, P.L. Gould, S.D. Gensemer, J. Vala, R. Kosloff. (2004). Ultracold Collisions Induced by Frequency-Chirped Light. In International Conference of Atomic Physics. Rio de Janeiro, Brazil. M.J. Wright, P.L. Gould, S.D. Gensemer, J. Vala, R. Kosloff. (2004). Ultracold Collisions Induced by Frequency-Chirped Light. In Annual Meeting of the American Physical’s Societies Division of Atomic, Molecular, and Optical Physics. Tucson, AZ. M. J. Wright and W. Johnson. (1999). Thermal Equilibration of a Critical Fluid. In American Physical Society’s Centennial Meeting. Atlanta, Ga.
Matt Wright (2016, September). Atomic Physics with Nanosecond Frequency Chirped Laser Light. Pennsylvania State University, Berks Campus, Reading, PA.
Matt Wright (2015, October). Control of Ultracold Collisions with Frequency Chirped Laser Light. Atomic Physics Seminar at Stony Brook University, Stony Brook, NY. Matt Wright and Bridget Grifford (2015, April). Learner Developed Podcasts in an Upper-Level Undergraduate Physics Course. Adelphi University's: Teaching, Learning and Technology Conference., Garden City, NY. Eugenia Villa Cuesta and Matt Wright (2014, July). Fruit Flies, Magnetic Fields and Space Travel. Adelphi University, Garden City, NY. M. J. Wright (2014, January). Laser Cooling Dilute and Dense Gases. Brooklyn Tech High School, Brooklyn, NY. M. J. Wright (2013, November). Controlling Thermal Collisions with Frequency-Chirped Light. Richard Stockton College of New Jersey, Galloway, NJ. M.J. Wright (2013, March). The Luck of Teaching: A Workshop Exploring Teaching Successes, Challenges, & Serendipity. Adelphi University, Garden City, NY. M. J. Wright (2013, January). Negotiating Faculty Offers Panel. FAS Office of Postdoctoral Affairs at Harvard University., Cambridge, MA. Wright, M. J. (2012, February). Cold Source for Atom and Molecule Laser Cooling Experiments. Westminster College, New Wilmington, PA.
Wright, M. J. (2012, February). Cold Source for Atom and Molecule Laser Cooling Experiments. AMO Seminar, University of Connecticut, Storrs, CT.
Wright, M. J. (2011, August). Progress Toward Magnetically Trapping CaH. Seminar, University of Ulm, Ulm, Germany. Wright, M. J. (2011, January). Progress Toward Magnetically Trapping CaH. Hot Topic Talk, Ringberg castle workshop on Cold and Controlled Molecular Collisions., Tegernsee, Germany. Mohring, R and Wright, M. J. (2009, June). Inside the operations of an intermodal rail terminal. Princeton Consultants: Quarterly Meeting, Princeton, NJ. T. Paltoo. A Journey of Creation. Physics Today Daily Edition. 10.1063/PT.5.2019 (2014). NSF: RUI: Atomic Physics with Rapidly Frequency Chirped Laser Light, award # 1803837. 2015 Adelphi Faculty Development Grant: Frequency and Amplitude Detection of a Rapid Modulating Laser Beam II. 2015 Adelphi Faculty Grant for High Impact Teaching and Learning Practices: Peer-Reviewed, Learner-Driven Podcasts for Upper-Level Science Courses. 2014 Adelphi Faculty Development Grant: Frequency and Amplitude Detection of a Rapid Modulating Laser Beam. Frederick Bettelheim Research Award: Testing out the Limits of the Landua-Zener Theory using Frequency-Chirped Laser Light. Marie Curie Fellowship. 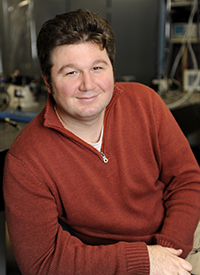 This $200,000, two-year fellowship provided the funding for fundamental research on ultracold strongly-interacting Fermi gases. This work was completed in 2007. 2016-2017 Finalist for the Society of Physics Students' Outstanding Chapter Adviser Award. 2015-2016 "Teaching Excellence Award" for non-tenured faculty, from Adelphi University. 2014-2015 "Professor of the Year" From Adelphi's Student Government Association.